Beware! BerryMarkets is an offshore broker! Your investment may be at risk. BerryMarkets is an offshore Forex brokerage registered in St. Vincent and the Grenadines. It provides the MT4 trading platform, and an extremely generous leverage. Traders are extended a leverage of up to 1:200. Furthermore, there is a wide range of trading products from which to choose, but the spread of 1.7 pips is a bit high and not in favor for the traders in our opinion. 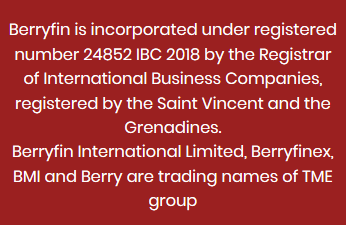 On the brokers website we read that the broker brand is owned and operated by a SVG-based company with the name Berryfin. Saint Vincent and the Grenadines is a well-known offshore zone and a preferred location for shady brokerage. We remind readers that the government of SVG has multiple times publicly stated that it does not oversee Forex trading and thus we may safely conclude that not only is the brokerage not regulated. Furthermore, trading with an offshore, unregulated brokerage hides a lot of risk. There may be commingling which means that the brokerage may commingle together the finances of the firm and the finances of the clients. The brokerage does provide a test-drive for the MetaTrader4 trading platform. On it we could see a spread of 1.7 pips on EUR/USD which is higher than the industry average of a pip and a half. Furthermore, the leverage extended to clients is 1:200 which, however, hides the undesirable risk of losing more than the initial deposit. We cannot discern from the website how much is the required minimum deposit, usually brokerages require at least $250. Overall, the lack of regulation and the questionable trading conditions incline us to suspect that potential clients of the brokerage may be open to substantial risk. We could not open the terms and condition of the brokerage due to some technical difficulties. This is yet another warning sign that the brokerage has ill-minded intentions. Without reading the terms we cannot be certain about the broker’s withdrawal policy which is among the most important features of a broker.